The Fellowship was fortunate enough to obtain a copy of CAPTAIN MIDNIGHT #20 from Dark Horse Comics. The story is written by Joshua Williamson, art by Michael Broussard, colored by Javier Mena, and lettered by Nate Piekos of Blambot. Realizing that there are too many threats right now, Captain Midnight decides to do a fact finding mission to decide where his top priority should be. He “recruits” Helios for a dangerous mission…to infiltrate a Project Black Sky facility and hack into their system to obtain information. Sounds easy in theory, but it won’t be. Will Midnight be able to get the information he needs? And where will it lead him; provided he can escape Project Black Sky’s grasp? I’ve become a big fan of writer Joshua Williamson over the last couple of years, and this book is one of the reasons. It’s not a grim or gritty superhero book; it’s better than that. The book is a nice combination of adventure, intrigue and action. I’m ready to see Project Black Sky be more proactive (like they have in the webcomic); and the events of this issue may make that happen. I’m also ready to see the Dark Horse heroes join forces to battle this threat. Hopefully that will happen in the not too distant future. 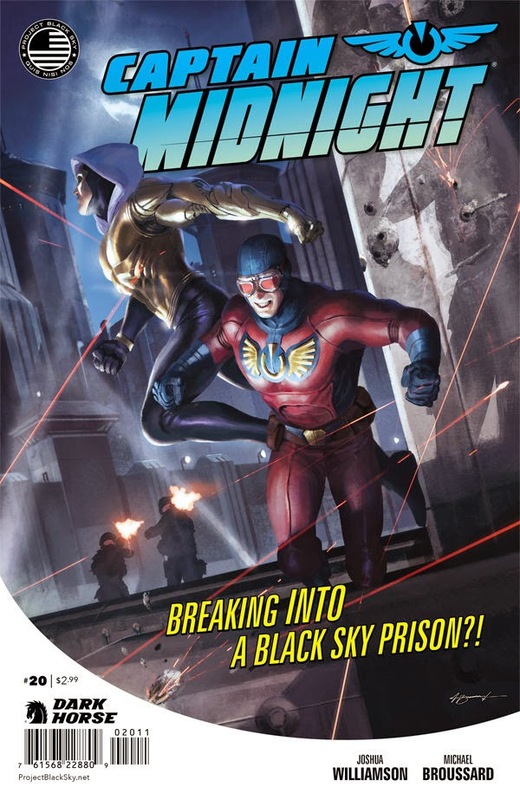 CAPTAIN MIDNIGHT #20 is in stores now, or available for ordering at www.darkhorse.com.